← Careful What You Think! There has been much talk about the mix-up at the Academy Awards last Sunday evening. “La La Land” was announced as the winner of the best picture award. Many people affiliated with the movie came up on stage to receive the award. In the middle of the acceptance speeches, there appeared to be some confusion. 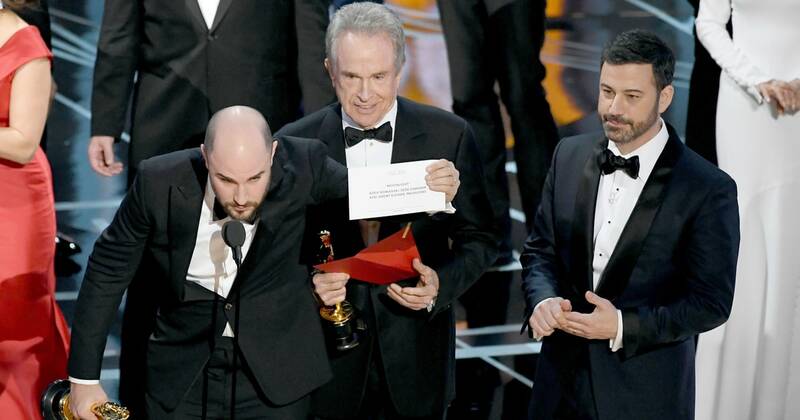 Then, in a shocking twist, it was announced that there had been a mistake—“Moonlight” was the actual winner of the best picture award. Imagine how it must have felt for those associated with “La La Land” to briefly think that they were the winners at the Oscars, only to be shocked by the realization that they had not actually won. Compared with eternity, the time that worldly people consider themselves to be winners is only a brief period in human existence. There will come a time when they will suddenly realize that they are not winners after all. Those outside of Christ will be devastated to finally understand that they are the losers and that they will receive no award. On the other hand, we in the church—who are made to feel like losers in this life—will eventually receive the recognition and reward reserved for those who are faithful to Jesus. This entry was posted in Christian Living, Church, Communion Meditations, Current Events and tagged 1 Peter 4:4, Academy Awards, announced wrong winner, Christians are winners, illustration, La La Land, Moonlight, Oscars. Bookmark the permalink.